Snippets exist in two states: private and shared. 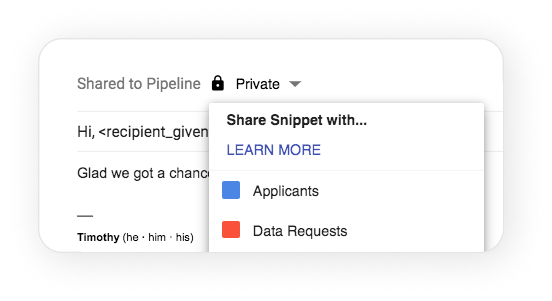 When a snippet is private, the snippet is unavailable to any of your other team members; when a snippet is shared, it's shared to a specific pipeline. For that reason, you will need to have created a pipeline and shared it with other users to also share snippets with them. When creating a snippet, you're given the option to add the snippet to a pipeline. Adding it to that pipeline will share it with anyone that has access to that pipeline. If you'd like to remove it and stop sharing, the option to make the snippet Private can be found at the list of pipelines.